I visited Prague last week for a conference on urban railway track construction best practices (more on the Urban Track conference). 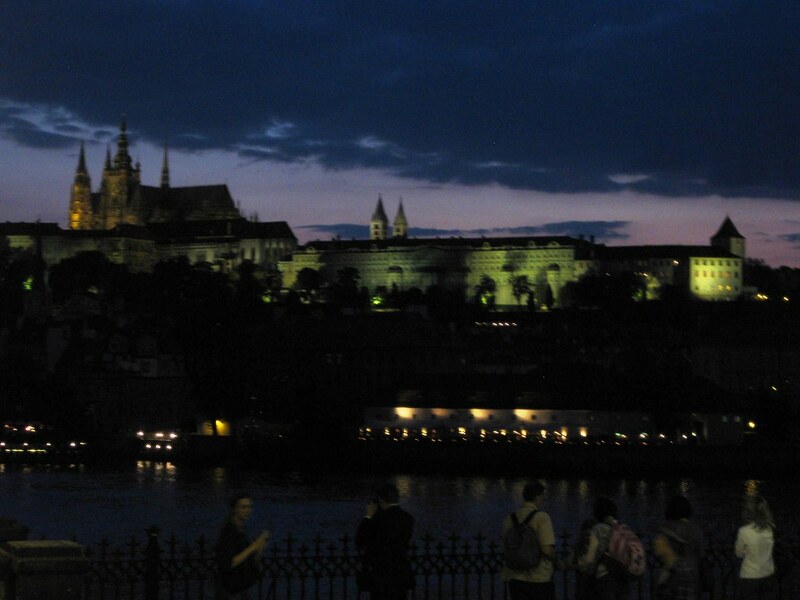 Prague is a fantastic city: you can walk from one highlight to the next. One of my favourite neighbourhoods is the old Jewish Quarter. I have visited the historic sights before and so now I just like to walk around the neighbourhood, being gently reminded of the Holocaust. Many buildings in this neighbourhood were built at the turn of the 19th Century and are Jugendstil (Art Nouveau) – perhaps my favourite building style. I skipped breakfast in my hotel both days and walked to a really fine bakery-cafe called Bake Shop for espresso and pain au chocolat … a real treat. The weather was beautiful and I could sit out doors and enjoy my breakfast. 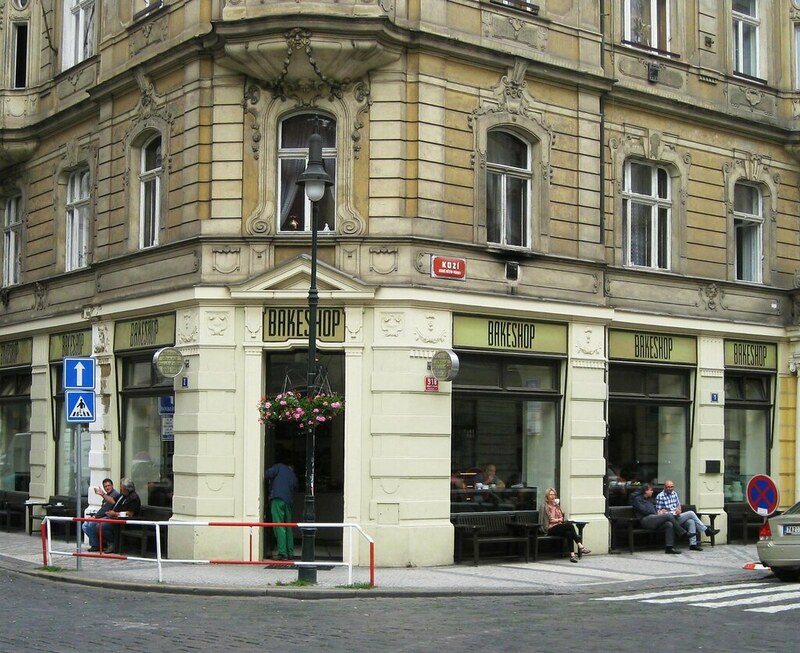 One of the things I love about Prague is that it is so quiet on the streets (at least in the centre) and so you can really enjoy sitting outside eating. As I was leaving I noticed how the roof lines were making nice patterns against the clouds and started taking photos of rooflines meeting the skyline. 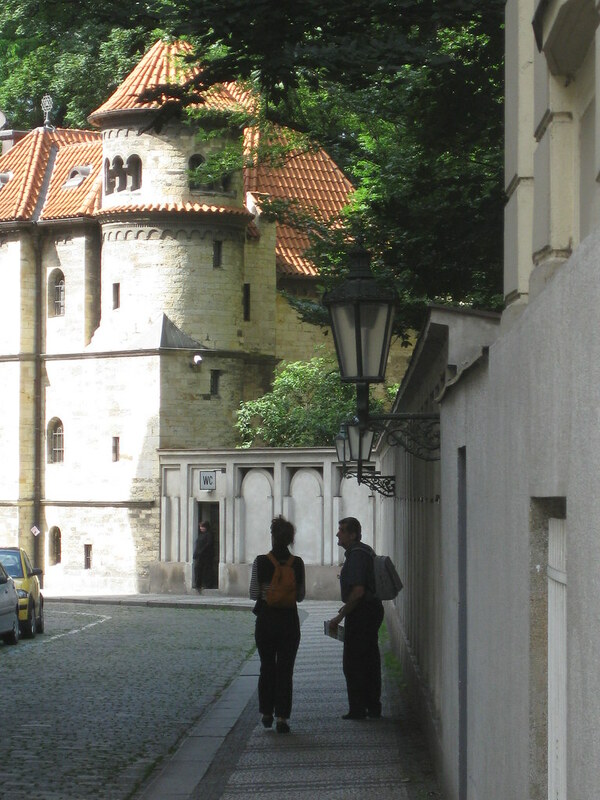 Many of the photos are buildings from Parizska street and the Jewish Quarter. I couldn’t help but notice that today’s contribution to how buildings meet the skyline is generally cellular telephone antennas or satellite television disks. Another really cool thing I noticed about Prague is the many arcades running through buildings between streets. 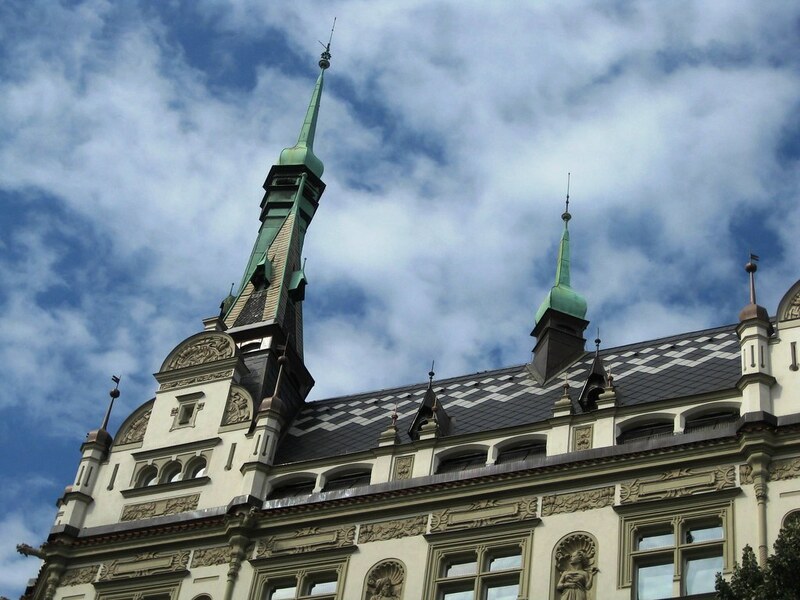 I talk about Prague’s arcades in future post. After the first day of the conference we had a reception at the Prague Tram Museum (website lists all Prague museums, scroll down to tram museum info). The museum is really great, many old vehicles all very well restored. It is an old tram barn, naturally, and it has been very nicely cleaned up. The descriptive texts are in the Czech language, but there is a brief guide for the museum in English. It’s one of the better tram museums I have visited. 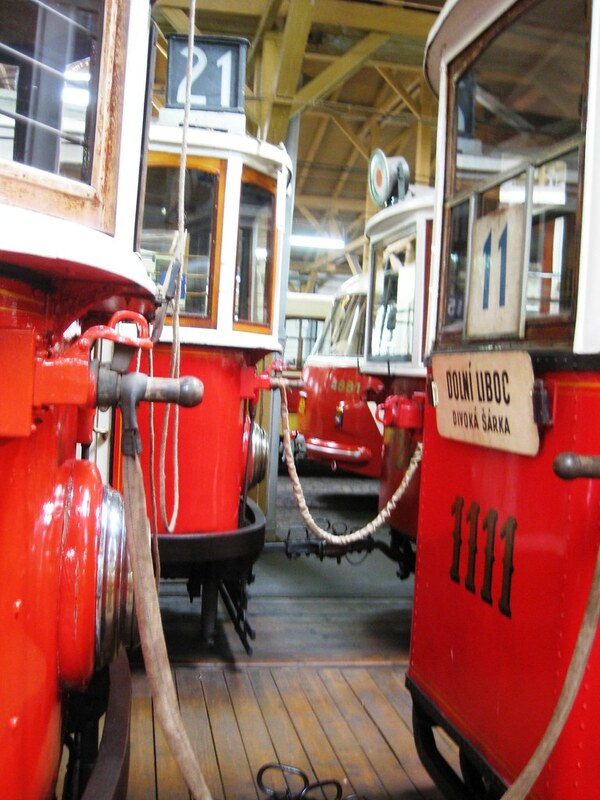 (Some photos of the Prague Tram Museum are here.) Here’s a link to information about historic trams in Prague. The reception was very nice, good food and local beer/wine. They served a very nice Goulash made with lots of cumin and also green beans. As a real Goulash fan I enjoyed it very much. Another nice touch was a six-piece jazz band. They did lots of standards including Girl from Ipanema … of course after hearing that I talked to the band leader and “casually” mentioned that I had written new words for the song (The Bus From Curitiba) thinking he might suggest that I sing it, but alias that was not to be, so the YouTube version will need to be it for now, but they were really good and what a wonderful place to perform the song. I’ll keep looking for more opportunities. After the reception we took a night walk through the city, first stopping at the main square where live outdoor viewing of the world cup was going on, then through the old city to the Charles Bridge, it was dark by then, but everything is well lighted. Over the bridge and then up to the castle where there were only a few people, but again, everything well lighted. Then back down the hill to the hotel where I had to wake up early to make it to the Bake Shop before the conference started. I’m writing from the train on my way back to Vienna. The fast trains between Prague and Vienna seem quite crowded (especially 1st class – many tourists). On the way to Prague there was only one 1st class wagon – with several children playing video games (with the sound turned on) and two infants crying … so it was really not relaxing. Today the air conditioning is not working very well – in the second 1st class wagon it’s not working at all! The railways really need to do a better job! 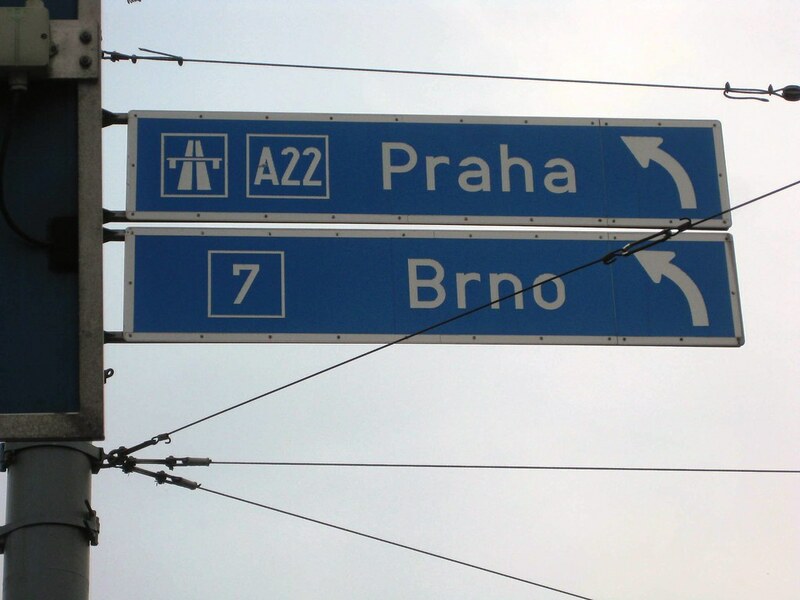 I have driven by one of these traffic signs so often, yet have not made it to Praha yet!